I have been meaning to buy a non-stick pan for years but couldn't find the one I like and I could trust for safety reason. My old non-stick pan's coating flaked off and not safe to use anymore. I love to cook food with less oil and calories if possible. I have been searching for a safe to use one. I heard that non- stick pan coating produce harmful chemicals that get mixed to our food, that's why my old one got thrown out. So happy when I was given an opportunity by Ozeri to review their 12 inches frying pan. 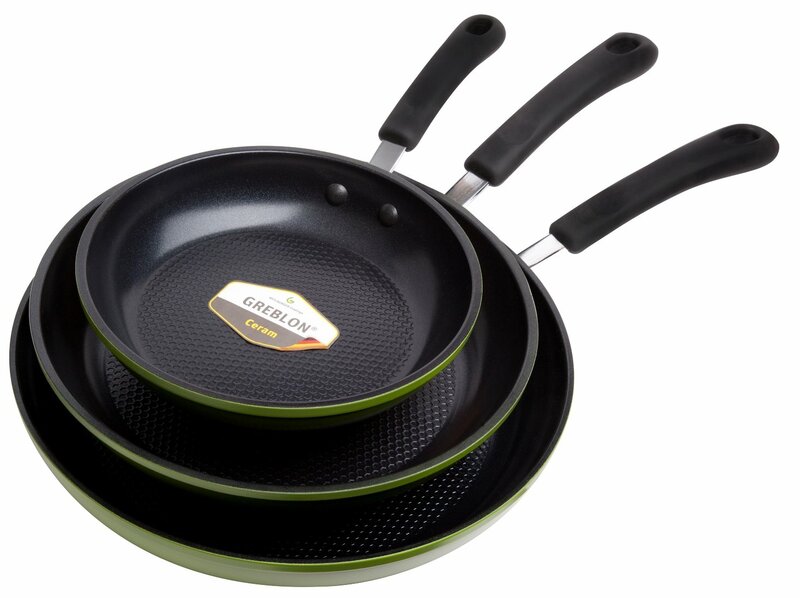 Their Green Earth non-stick frying pan comes in 3 piece set of 8", 10 and 12". Continue reading below for find out why these non-stick pans are awesome. I was so excited when the product came. In fact we tried used it right away. The product was wrapped up pretty good making sure it won't get scratch during shipping.What I noticed using Green Earth Non-stick frying pan is that it cooks my food evenly. The way the pan texture surface was design, it distributes heat evenly. The pan cooks better if you allow the pan to reach the temperature first. The directions also say that I have to put a little oil on the pan to seasoned it. I didn't need to put a lot of oil, in fact I could wipe the oil off afterwards prior to cooking. I like that the handle is made of heat resistant silicon I don't need a glove to hold the pan. I find it super easy to wash the pan but also I don't wash it every after cooking. I think it will last long if I just wipe the oil off every after cooking. I like that this pan has an ultra ceramic coating which make it 100% PTFE and PFOA free. Here is the photo of the pancake I made. See how it browns evenly. My pancake seems fluffier too. I received the Green Earth Non-Stick Frying Pan from Ozeri for free for product evaluation purposes. However, all opinions expressed is solely my own and not influenced in any means.